We live in an era of portability and convenience. This is true for all the devices we use, right down to the other gadgets and assets that we covet and hope to own. Now, when it comes to the television, we have all experienced the frustration when our favorite series was on air and we had to strain our ears to listen to the nuanced conversations, or gritted our teeth in anger at the limited capabilities of the television speakers. A portable speaker is a great solution for those who will not compromise on the sound quality, the best thing about these speakers is the fact that they are portable, deliver a good sound and while they not as good as a surround system sound, these speakers more than hold their own above built-in television speakers. 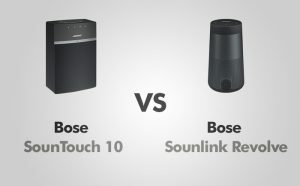 In this comparison, I will compare two sound solutions from the Bose stables, the Bose Soundtouch 10 and the Bose Soundlink Revolve. Manufactured in the United States, these speakers will be compared on important benchmarks like the design, the quality of sound, available features, the ease of installation and finally a list of the pros and cons of each device. Portable Bluetooth speakers are touted for their design, and it plays an important part in buyer discretion. When was the last time you heard of anyone buying an ugly looking Bluetooth speaker? Suffice to say that being from the Bose stable, both the speakers score big on design. This model is available in both black and in white. It is tastefully done up in rubberized plastic, matte and features a control pad on the top. The front panel has four LED’s, which are for the power, Wi-Fi, the Bluetooth connectivity and Aux connection. True to nature, the design is tasteful and minimalistic; a chrome strip separates the front face near the middle, with the speaker grille beneath it. The rear of the speaker has a dent that helps the speaker grip the surface of the table or deck, the bottom also sports a couple of rubber strips so that the speaker has a firm footing. The remote control also ensures that you do not have to approach the unit time and again to adjust controls. This impressive model is composed of a single aluminum sheath and has a base and top made of rubber. The control buttons sit at the top, and they are the volume, the play/pause/calling and another for the wireless connectivity. For charging, there is a four pin mount on the bottom, and the cylindrical speaker’s rear grille has the micro USB as well as the 3.5 mm auxiliary ports. The output audio favors the bass and has a tendency to subdue the mid-range frequencies. The sound booms from the speaker, good enough, but the leaning towards the bass frequencies implies that the clarity of tracks suffers a bit. The stiff lower frequencies also contribute towards the predominance of bass. But the mid-frequency range is not to be dismissed either. Dynamic balancing is an inherent part of the system, one that it does automatically, and you have high frequencies sounding sharp and very well balanced, this makes the audio sound rich and warm. The Soundtouch is perfect for a private audience in a living room and other casual listening scenarios. The best range to hear the best output audio is at 40% of the volume, where there is zero distortion and dynamic balancing works its magic. The Soundtouch 100 has a whole range of options for connectivity and features that can be customized. It can be set up with other speakers to deliver sound across all your rooms, and this is its Multi-Room format. Internet music, music from the radio and for that matter any sound streaming device works well in tandem. This speaker gets its name from the 360-degree omnidirectional design. This small but dynamic portable speaker delivers uniform audio output and has uniform audio distribution. Tracks which have separate channels sound good, but there is little to distinguish between audio channels. The sound favors the bassline, and low frequencies are given preference. Low range frequencies are quite clean, and they lead on well into the mid-range and high range frequencies. Bass detail is awesome, and the notes are clean and accurate. Even when you play tracks with high frequencies predominating, the low frequencies more than hold their ground, making a pleasant listening experience. Mid-frequency sounds are muted in comparison to the low frequencies, and there is a mellow and sophisticated undertone. Also, high pitched sounds do not sound ear-splitting, which is good. Only where the music is predominantly instrumental, you find the vocals to be a bit out of their depth. For a portable speaker, it scores high, and it does a commendable job with the audio. The Bose Soundtouch 10 comes with the Soundtouch app. All you would need to do is to plug in the speaker with the choice of input plug (of which Bose provides a few different options), connect the Wi-Fi to it, and then control the speaker with the help of the app. With Bluetooth it is possible to play music from your phone or the tablet, the computer and even television, which is basically your whole gamut of sound options. You are free to connect this speaker via any of three possible modes; Bluetooth, aux, and micro USB. The top of the speaker has buttons which makes it easy for you to switch seamlessly from Bluetooth mode to the audio mode. And as promised, the Bluetooth connectivity is good for as far away as 30 feet. The memory of the speaker can keep up to four devices paired and the speaker connects on the basis of priority. Pushing the Bluetooth button allows manual switching between two devices, and the USB button can be tapped to switch over to wired settings. Taking an hour and a quarter to charge and then delivering 14 hours of great music is certainly impressive, and the interface is sophisticated enough to make even the worst music listener coming back for more. CONS: There is distortion at higher volumes/ The treble may sound harsh to discerning ears / There is a preponderance of bass. CONS: The midrange sounds are a bit off the mark / It is a bit heavy for a portable speaker. Both these offering from Bose are stellar products and one would be hard pressed to choose a particular model over the other. But if I had to make a choice, it would be the Bose Soundlink Revolve, for its better quality of the mid and high-frequency sound reproduction, and its higher portability.